Processing of steel for hulls no. 476, 477, 478 and 479 – four multipurpose container vessels contracted for Brodosplit Navigation Ltd in class with DNV, GL – started on a sheet-cutting machine at Croatian shipyard Brodosplit. The 24,000 dwt newbuildings will be 184.43 meters long, 27.5 meters wide and 15.80 meters high, being able to carry 2,000 TEUs at a 18-knot speed secured by 11060 kW engines. “By building these ships we enter a shipbuilding market niche that will enable sustainable business operation, bigger engagement of capacities and acquisition of references for building of ships that will be in higher demand in the near future” Tomislav Debeljak, Brodosplit CEO, pointed out. The special feature of this vessel is that it will use the LNG fuel to be more attractive in the global shipping market due to new national and international regulations. The Brodosplit container vessel will have a low speed 2 stroke dual fuel” (LNG/HFO) engines that have higher efficiency (lower energy) and work at lower RPM (low speed engines), resulting in lower maintenance costs and a longer life span. The new container vessels, in fact, will have 4 to 5 times lower cost than other ships of this class, and 30-50 times will pollute less the environment; thanks to more efficient consumption and superb efficiency, investments in the 2 stroke dual fuel engines – made (as well as the special tanks for LNG fuel) by the Brodosplit diesel engine factory, under license of MAN – will be paid out over 2 to 3 years of exploitation. Meanwhile, the loading of fitted sections, with 1,450 tons of steel equipped with piping, ironmongery components and electric routing on a special cargo barge delivery, was executed too. Four blocks will be towed to Monfalcone Shipyard where they will be assembled on the cruise ship built in the dry dock. The sections included a bow structure with three built-in thrusters, bulbous bow, ballast tanks and structures consisting of several decks with built-in equipment. The contract, also included piping and electric routing works. “This is the most demanding part of ship’s hull that includes bulbous bow, bow structure with three built-in bow-thrusters, few ballast tanks and hull structure consisting of several decks with built-in equipment” explains a spokesperson. 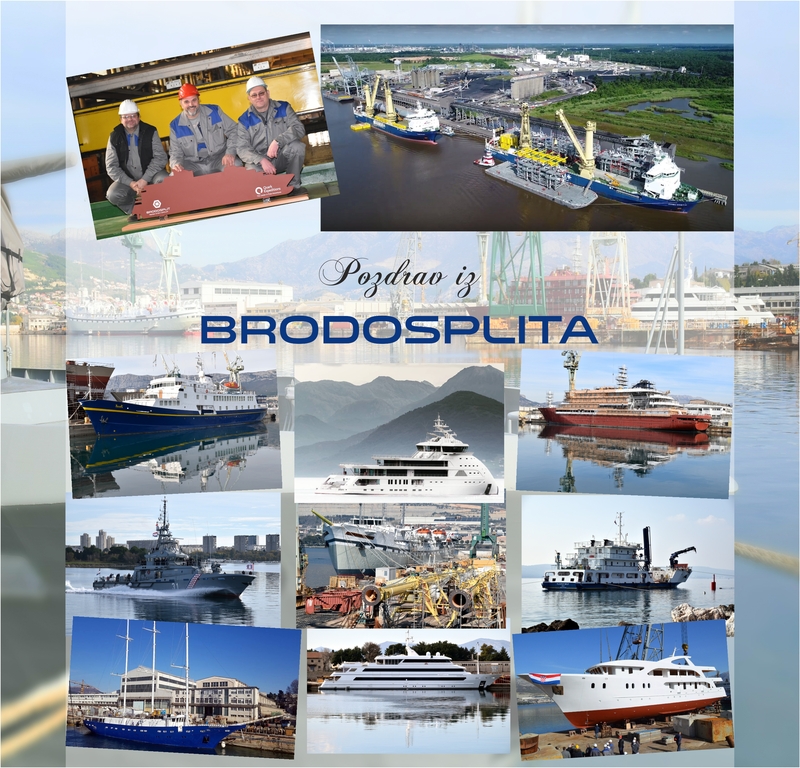 This is the third project for Brodosplit which contracted the building of bow hull sections with Fincantieri. Croatia’s largest shipyard, Brodosplit (Shipbuilding Industry Split Inc.), Member of DIV Group, covers an area of 56ha. Its current order-book has the 17 following projects: 1 river cruiser (105-meter long), 1 working boat-concrete (48 meter long) for Plovput, 1 60-meter sailing boat for our own use (in series of 5), 1 cruiser sailing ship (162 meters) for Star Clippers Ltd, 5 onshore patrol ships for Ministry of Defense, 4 container vessels (180-meter long) for Brodosplit, 4 steel hull and superstructure for mini-cruisers for domestic buyers. Certainly the most intriguing project is the one for Monaco-based Star Clippers. Processing of steel for the sailing ship started on the sheet – cutting machine on 29 September. This is the largest square-rigged ship contracted for the Monaco buyer: it will be 162 meters long and 18.5 meters wide, with deadweight of 2,000 tons, 5 masts and sails with overall surface of 6.347 square meters. The type of Clipper sailing boat with such sail-plan is called a barque. The Marine platform at the stern will be equipped with the mechanism for opening and lowering until the sea level so that the passengers will have the direct sea access. The ship will have steel construction while the deck will be fully covered by the highest quality teak. In addition to shipbuilding activities, Brodosplit is also involved in civil engineering works. Year 2015 kicked off on a high note when the shipyard won a EUR 50 million contract to build 41 floodgates that will protect the city of Venice from rising sea levels within the MOSE project. The floodgates, to be installed on the mouths of Malamocco will be 4,5m thick and measure 30 x 20m and Chioggia rivers will be 5m thick and measure 27 x 20m. The design centres on internal reservoirs that can be filled by either air or water; when they are filled with water, they will lie flat on the seabed, when there is a risk of flooding, the reservoirs will be filled with air causing the gate to rise and therefore close the entrance of the river. At Shipbuilding Industry Split 2 large gantry cranes of a type Boxer 6000 for container handling contracted for German Company Kocks Krane are being built. Split shipbuilders will process 600 tons of steel, which includes the making of steel construction of the 130-meters long main horizontal girder, making of steel anchors, engine room and main energy supply plant, and making of the main app. 5 meters long drum spools.